Professor of Finance at EDHEC Business School and Director of EDHEC-Risk Institute. Research Director at EDHEC-Risk Institute. Factor investing is an investment paradigm under which an investor decides how much to allocate to various factors, as opposed to various securities or asset classes. Its popularity has been growing since the turn of the millennium, especially after the recognition in 2008 that multiple asset classes can experience severe losses at the same time despite their apparent differences. The term “factor”, however, is used with many different meanings depending on the context and the targeted application. The main goal of this paper is to provide clarification with respect to the various possible definitions of factors that are relevant in investment practice. 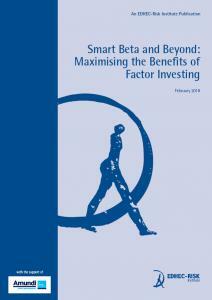 This paper also develops a framework for allocating to factors in two main contexts, namely allocation decisions at the asset class level, and benchmarking decisions within a given class. For each of these applications, we examine the three most important questions raised by the adoption of a factor investing approach: (i) why think in terms of factors? (ii) what factors should be chosen? and (iii) how do we allocate between them?